For most people, buying a home is the largest single purchase they will ever make. 1st Choice Home Inspections has helped more than 16,000 people decide if a particular house is right for them based on the home’s condition at the time. What Is A Sewer Scope Inspection? A sewer scope is an advanced piece of technology allowing the inspector to see inside the main sewer lines of the house, from the cleanout to the city tap. An industrial endoscope is the best way to describe the sewer scope. A high definition camera is mounted on the end of a heavy duty cable, which is then inserted into the plumbing system at the cleanout access point. The camera and cable are pushed through the main sewer line providing live pictures to the inspector through a color video monitor. As the live video feed is received, the sewer inspector looks for any abnormalities like clogs, leaks, broken pipes, and roots breaking through the line. The computer system allows the sewer inspector to attach notes to the video as well as record audio commentary. The video, the notes, and audio, are all saved and become part of the sewer scope inspection report. 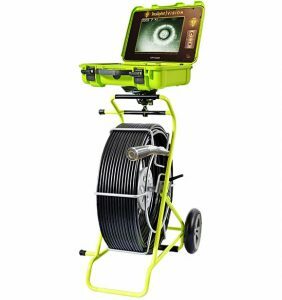 The Opticam Modular Sewer Inspection Camera pictured on the right is the same system 1st Choice Home Inspections uses for our sewer inspections. It is an amazing piece of technology and we are proud to use it. Do I Need a Sewer Scope Inspection? A major factor in determining a home’s overall condition is the state of its plumbing. While a typical home inspection includes a basic plumbing inspection, it does not include the more advanced sewer scope inspection. Tennessee law does not require these types of inspections, and it is beyond the scope of a typical home inspection. However, a sewer scope inspection can provide you with information about a home’s plumbing that could possibly save you thousands of dollars. Plumbing does not last forever, and homes built more than 25 years ago certainly should have the sewer system checked. If you are considering buying a building with large, mature trees nearby, you should seriously think about having a professional perform a sewer inspection. Tree roots are one of the top reasons sewage lines crack and leak. Can you imagine buying a home and six months later disovering that roots from that beautiful mature tree growing in your front yard have damaged your sewer line deep below the surface? Now you need to hire a plumber to dig up your yard and make repairs. Faulty sewer lines can cost tens of thousands of dollars to repair. Most potential home buyers have no idea what the condition is of the plumbing in the foundation or under the ground of the home they are about to buy. Why would they? However, with a sewer scope inspection, you can know if there is an issue with the plumbing before you buy. Who Can Perform a Sewer Scope Inspection? Amazingly, most home inspection companies in Tennessee do not offer sewer scope inspections. Why? Because training and expensive equipment are needed to perform this service. Most home inspectors do not go through the process to obtain these. At 1st Choice Home Inspections, we go the extra mile to make sure our clients are happy by providing as many services to them as possible. In addition, Tennessee state laws do not require sewer scope inspections before selling a home like in some other states. The cost of a sewer scope inspection is $280.00 when purchased in conjunction with a home inspection. A standalone sewer scope inspection is $350.00 in most cases. For inspections involving unusual travel distances, we reserve the right to charge slightly more. Call us for an exact quote. Why 1st Choice Home Inspections for My Sewer Scope Inspection? 1st Choice Home Inspections has the sewer scope inspection training and state of the art equipment. Our home inspectors are honest, reliable, and serve the interest of our customers. With more than 16,000 completed home inspections, an A+ rating on Angie’s List, and more than two hundred 5-Star Google reviews, you can relax knowing we are good at what we do.